When I came back from Bali last week, I brought back with me packets of different types of tea. One of which is my all time favourite, Earl Grey. 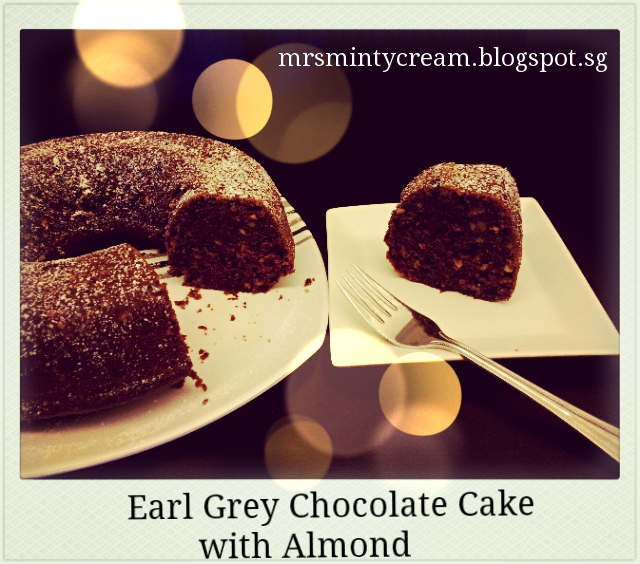 I really like the distinctive aroma of the earl grey tea, especially so when it is use in bakes. My initial idea was to make a simple Earl Grey Cake, with a light brushing of lemon syrup on the top. But since I was having this craving for chocolates, so I thought, why not combined the two? There, you go. Earl Grey Chocolate Cake. The almonds were added so as to give the cake a better texture and better crunch when you bite into the cake. 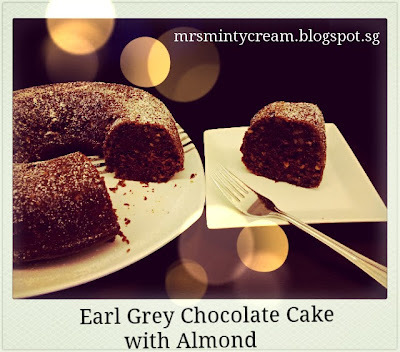 Be prepared to receive a really moist chocolate cake with strong and rice flavour of earl grey in it. Yummy! 1. Brew the tea in the hot water and let it simmer. Remove the tea bags after 30 minutes for a strong tea flavour. Set the brewed tea aside for later use. 2. Melt the chocolate using microwave and set aside. 3. Preheat the oven to 180C and butter the bundt pan evenly. 4. Sift the dry ingredients (flour, baking soda, baking powder, salt) and set aside. 5. Cream the butter and sugar using a mixer and when a creamy mixture is obtained, add in the eggs and melted chocolate. Make sure the mixture blend well. 6. Using a spatula, fold in the flour mixture (1/3 portion at one time) into the wet mixture and make sure the combined mixture is well blended. 7. Alternate the addition of yogurt and tea into the batter and you should get a well-mixed smooth and creamy batter with no traces of flour. 8. Mix in the almond bits using the spatula. 9. Pour the creamy batter into the bundt pan. Using a butter knife, run the knife through the batter a few times so as to remove any air bubbles. 10. Bake for about 35 minutes. Invert the bundt pan immediately on a raised cooling rack and allow the cake to cool. 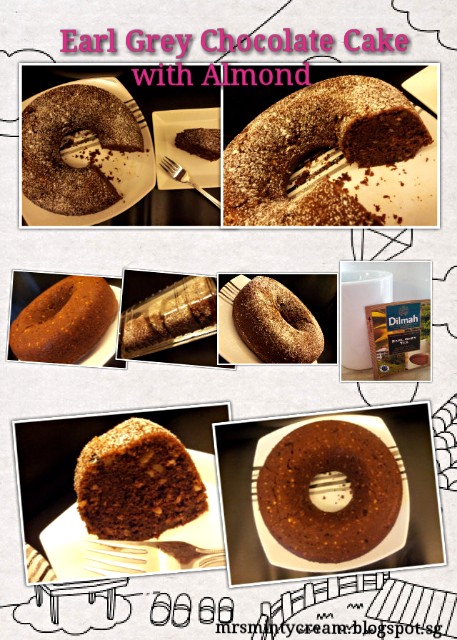 When the cake is completely cooled, removed the bundt pan and dust the cake with icing sugar before serving.